A delightful surprise awaits you! 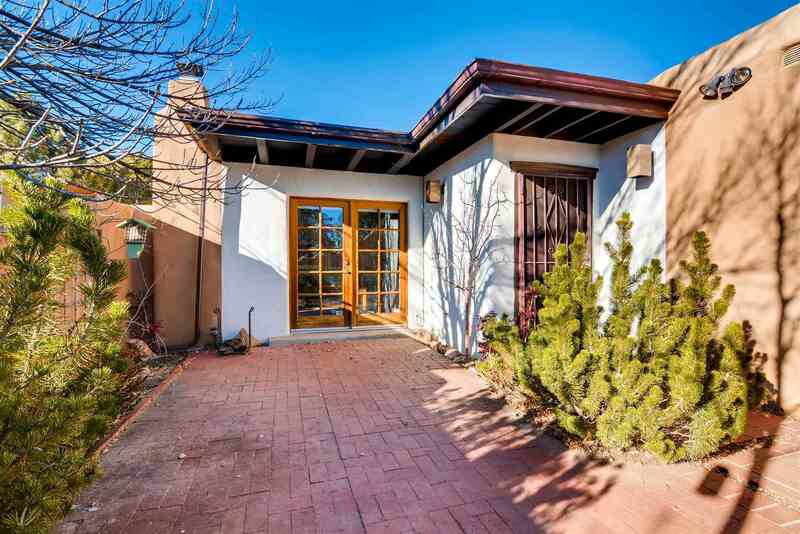 This very special condo unit has a spacious feeling with all the right Santa Fe touches. French doors invite you to a large south facing courtyard, and this spot also becomes a bird sanctuary. The end unit location offers peace, privacy and stillness. Generous over sized windows in the living room promise you nightly sunsets. And a very special dining room (formerly an atrium) has a huge ficus tree creating an arbor-like setting, making every meal special. The kitchen has a corner kiva, with a built-in bench - what a cozy spot to read. Single level throughout, nothing will trip you up! Renovations throughout, including new skylights/new roof with warranty, walk-in shower in main bedroom suite, lots of closets and built-ins. Rarely does such a sweet condo come on the market, especially in this "move-in" condition. Short term rentals as not allowed in this association: rentals must be 30 days or more. Oh, and the location! Minutes to the Lensic, downtown restaurants, library, etc etc. And the DeVargas Mall is a quick drive for any need, from ice cream to new shoes! And - Ft Marcy recreational center is just at the bottom of the hill for all exercise/gym/tennis/dog park facilities. Can you envision such easy living? Directions To Property: Take Old Taos Highway And Turn Left Onto Calle Loma Norte. Continue To The Second Entrance On The Left, Sign States Placita De La Questa, Turn Into This Placita, Drive Slowly Around Curve To The Right And The Unit Will Be The Last On The Right. Plentiful Parking.